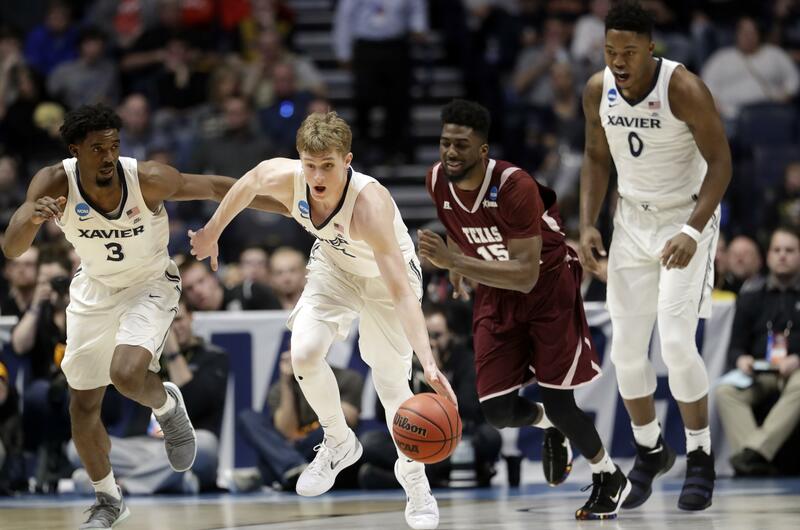 Fri., March 16, 2018, 8:59 p.m.
NASHVILLE, Tenn. – The Xavier Musketeers looked every bit like a No. 1 seed their first time around in the role at an NCAA Tournament. J.P. Macura scored 18 of his career-high 29 points in the first half, and Xavier routed No. 16 seed Texas Southern 102-83 Friday night in their tournament opener in the West Region. The Musketeers (29-5) will play either No. 9 seed Florida State or eighth-seeded Missouri on Sunday for a berth in the Sweet 16. Trevon Bluiett added 26 points, and Kerem Kanter had 24 for the Big East’s regular season champs. With celebrity fan Bill Murray watching, Macura helped Xavier respond when falling behind 20-13 within the first five minutes. Macura scored 15 points to key a 21-2 run that put the Musketeers ahead for good. Macura’s fourth 3 capped the run with 7:12 left and Xavier securely ahead 34-22. Texas Southern (16-20) came in having won the first NCAA Tournament game in program history, a First Four win over North Carolina Central in Dayton on Wednesday night. The Tigers and confident sophomore guard Damontrae Jefferson wanted much more history with a win in the first round that would have made them the first 16 seed to knock off a No. 1. Jefferson and the Tigers simply couldn’t match Xavier’s shooting. Jefferson did steal the ball and score on a layup just before the buzzer, adding a free throw for good measure. That was as close as Texas Southern would get as Xavier led 49-37 at halftime. Xavier never pushed its lead past 24 as the Tigers, especially Jefferson – who played every minute of the game – kept fighting. The pesky guard kept scrapping for balls with four steals, even picking up a technical with 12:45 left. It just wasn’t enough against Xavier, with its four starters back from last year’s Elite Eight team. Jefferson scored 20 points to lead five Tigers in double figures. Derrick Bruce added 18, Robert Lewis had 14, Donte Clark scored 12 and Trayvon Reed had 10. Published: March 16, 2018, 8:59 p.m.